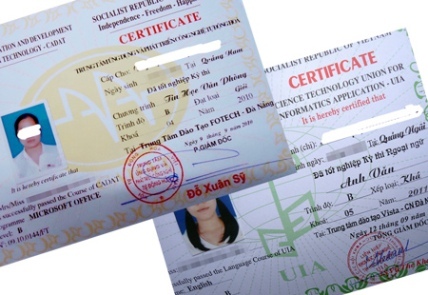 HAI PHONG (VNS) — Four persons have been arrested for running a fake certificate ring in Hai Phong City, using forged seals to create counterfeit certificates for English language, the municipal investigation police said. Nguyen Van Thuy, 26, Tran Van Viet, 24, Tran Duc Manh, 24, and Tran Thi Hanh, 34, were reportedly running an illegal operation under which they issued certificates for TOEIC, a type of English language test for international communication. The police are also looking for Ho Dinh Sung, 37, from northern Hai Duong Province, who was allegedly heading the ring. According to Thuy's testimony, the ring had issued 62 fake certificates to earn a profit of more than VND21 million (US$981).